"That which does not become a part of me, shall become one with the great void." 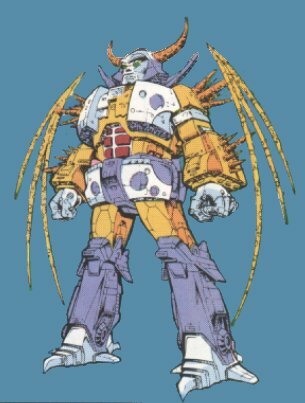 Profile: Created shortly after the dawn of time, Unicron is the most massive and deadly of all the Transformers. His goal is to absorb the universe! 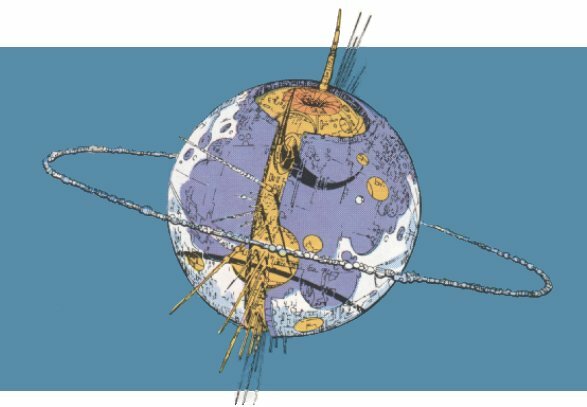 Abilities: The size of a large planet, Unicron derives sustenance from munching planets, moons, and even stars, thus making him larger and increasing both his power and his appetite. When it serves his interest, he has been known to make pacts with lesser beings, offering them stronger bodies and greater powers in exchange for their total allegiance. Woe be it to the would-be-betrayer, for Unicron possesses the ability to both give and take away. With the mere thought of treachery, the slave will find his body involuntarily twisting into painful contortions. Among his numerous subjects are the Quintessons, who hunt down anyone who escapes his wrath. The deadliest secret of all is that this rumbling juggernaut, when threatened, can transform into the goliath of robots, capable of swatting armadas to dust and tearing whole planets apart with his bare hands. Weaknesses: Unicron fears only one thing - the Autobot Leadership Essence. His mission for Galvatron: "Search out the galaxy and bring it to me!"